Pictured from top to bottom: Our Valet Jimmy, Marketing Coordinator John, Jessica Ann Kirby, Abigail Breslin, Emily Bache, Grace Atwood & Billie Carroll. 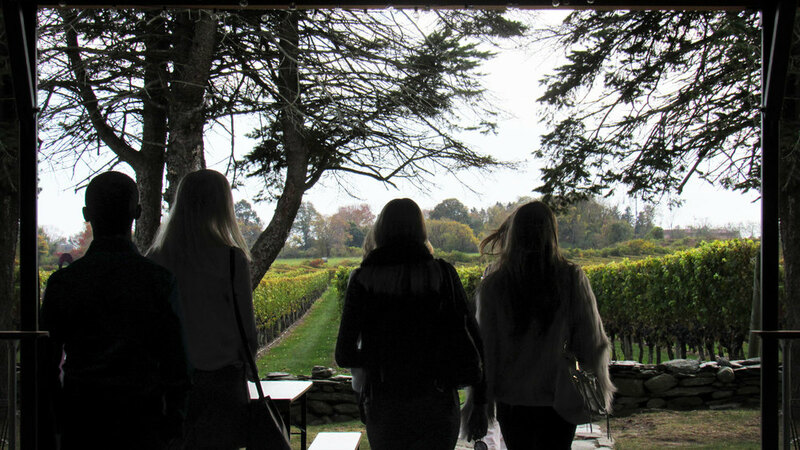 On a recent October afternoon, The Chanler was greeted by five of the blogosphere's biggest bloggers. They arrived for a 2 night stay at The Chanler. We were delighted to have the opportunity to introduce them to all of the ins-and-outs of Newport. With our "Chanler Secret Tour of Newport", the bloggers experienced our town in a unique way by learning often untold secrets behind its history while also seeing breathtaking sights that are sometimes missed without a guide. We embarked on a driving/walking tour of the city that began down Bellevue Avenue and past all of the majestic mansions. This included the Elms, Rosecliff & Marble House. A favorite spot amongst the bloggers was our stop at Rough Point, the Newport home of heiress Doris Duke. It offered sweeping views like this one of the Atlantic Ocean from the Southern tip of the island. We paused here for about fifteen minutes just so we could fully take in all of the surroundings. The feeling was overwhelming. There truly are very few places like this in the world. 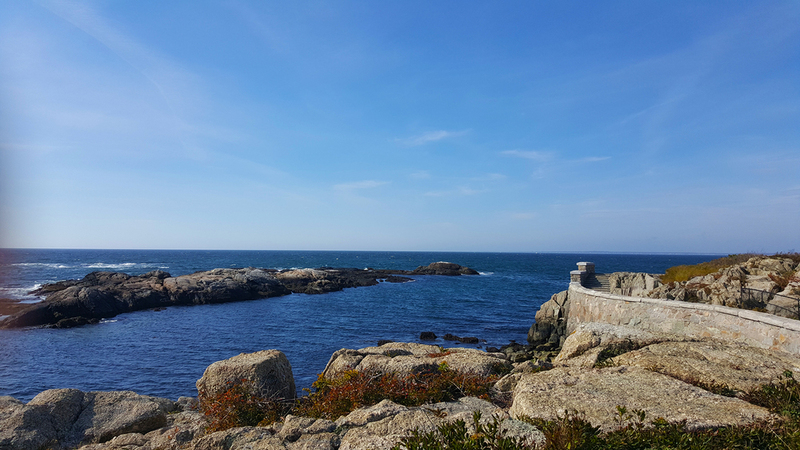 We continued our scenic tour along Ocean Drive where we stopped for pictures at Brenton Point State Park , Fort Adams & the Newport harbor. For the art history buffs, we visited our sister property, La Farge Perry House, to admire the murals of Newport scenes wrapping the walls of the dining room. While conversing with our innkeeper, the group learned some more fascinating facts about Newport's history. 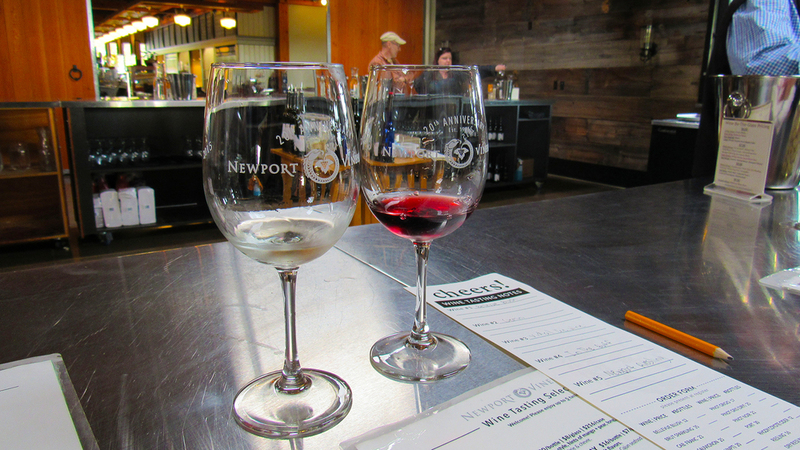 Next up: wine tasting at Newport Vineyards. With vines as far as the eye could see & a warm fall breeze blowing in the air, it was the absolute perfect day to tour the vineyard. 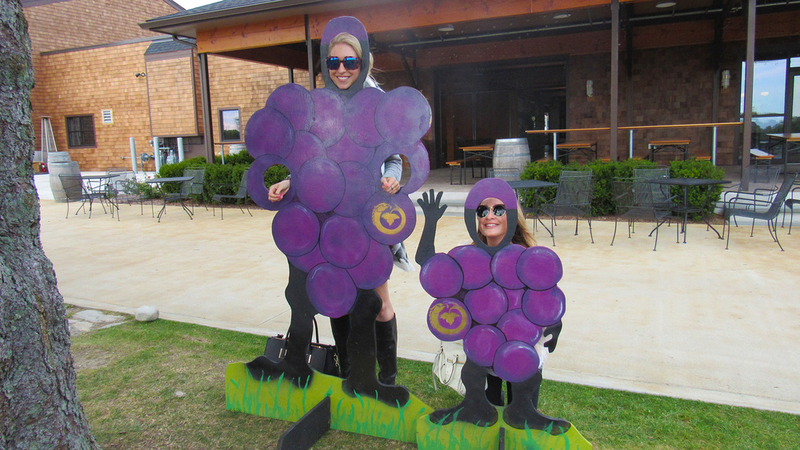 We were anxious to walk the grounds and observe the grapes from a closer vantage point. We were introduced to a knowledgable tour guide who explained the wine making process in precise detail. There was so much to learn on our tour of the vineyard. Aquidneck Island is actually one of the best environments to grow wine in our entire country! This is due to the warm waters of the gulf stream to our south interacting with the moderating effects of Narragansett Bay. This combination actually creates a micro-climate that is ripe for wine making. This year marks Newport Vineyard's 20th anniversary and in that time it has grown to an astounding 60 acres. How were we possibly going to see everything? While we continued along our walking tour, we stopped to pose for some humorous photo opps along the way! After a delightful tour around the grounds filled with lots of laughs, valuable insights on the wine making process & sweet aromas swirling in the air, it was finally time to awaken our tastebuds. We could choose up to 5 different wines for the tasting. The wine list was enormous, featuring numerous creative titles such as 'Bellevue Blush', 'In The Buff' and a classic, 'Newport Riesling'. Last, but not least, one of the best wines produced from our unique climate, iced wine! It was a tall order to not ask for an extra tasting. 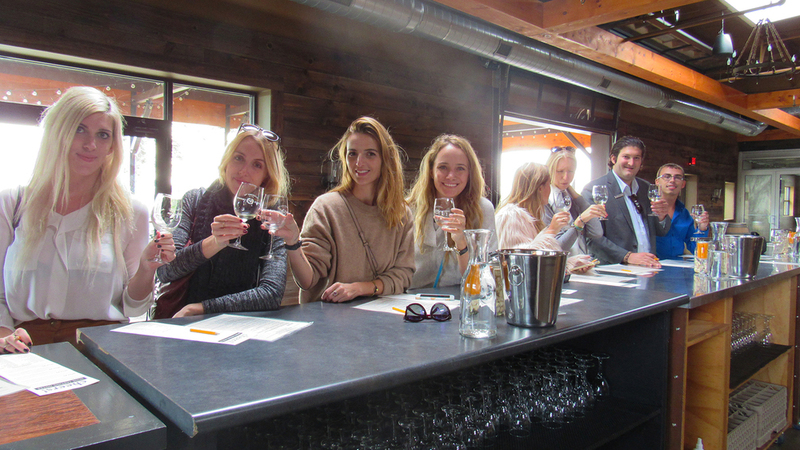 Exploring the newly renovated Newport Vineyards was everything that we could have imagined. We all had nothing but the utmost satisfaction as we left the vineyard and headed back to The Chanler via our complimentary car service. Our palettes were thanking us for the wonderful assortment of wine tastings that we each experienced. The only item left on our itinerary was dinner at a Newport restaurant. Our group dined at The Fifth Element, a restaurant with the perfect combination of rustic and industrial décor. When we all returned from dinner, the bloggers decided that it was the ideal time for a relaxing Chanler Bath Butler. What's a better way to end the night than soaking in bath oils by Aromatherapy Associates followed by a movie in bed, right?